“Nothing is worth more than laughter. It is strength to laugh and to abandon oneself, to be light. Tragedy is the most ridiculous thing.” Frida. 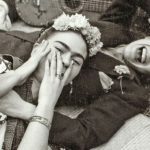 Frida kahlo & Chavela vargas.